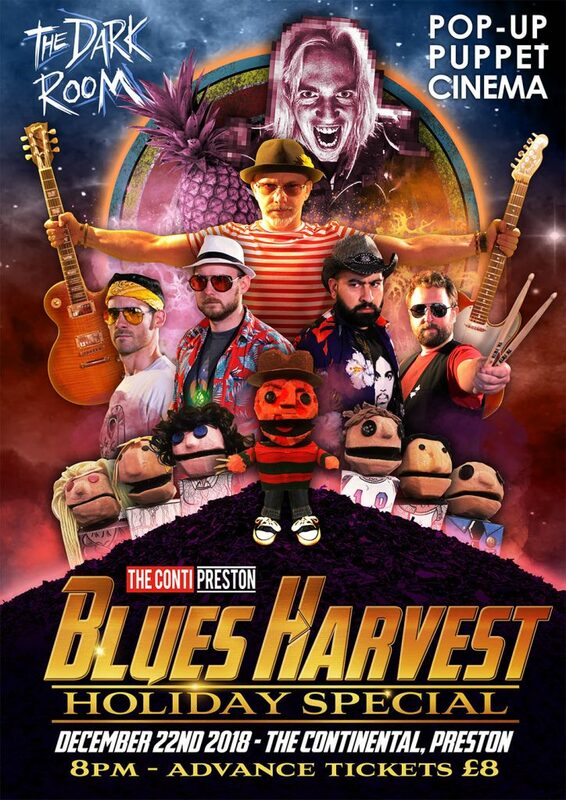 Cult comic book and Sci-Fi movie themed band BLUES HARVEST return to The Continental in Preston for their annual ‘Holiday Special’ (borrowing the event title from the ill-fated 1978 Star Wars TV special). This year POP-UP PUPPET CINEMA also return with their new show ‘A Nightmare on Elm Street’ alongside the acclaimed THE DARK ROOM from comedian John Robertson. The world’s only live-action videogame, The Dark Room is a sadistic, interactive bit of stand-up that’s toured the planet. Get ready to die! The best way to describe POP-UP PUPPET CINEMA is like Punch and Judy colliding with Hollywood. PPC condense classic films into live puppet shows, mocking the originals with plenty of warmth and admiration. This year the gang bring their outrageous new adaptation of ‘NIGHTMARE ON ELM STREET’. Notes: Cult comic book and Sci-Fi movie themed band BLUES HARVEST return to The Continental in Preston for their annual ‘Holiday Special’ (borrowing the event title from the ill-fated 1978 Star Wars TV special). This year POP-UP PUPPET CINEMA also return with their new show ‘A Nightmare on Elm Street’ alongside the acclaimed THE DARK ROOM from comedian John Robertson. ← Previous post:The gang go to Disneyland Paris!